Last week, along with a dozen other photographers, I made a trip to Yellowstone National Park. 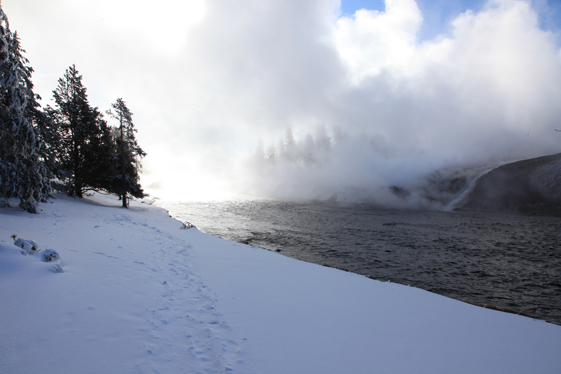 I found winter in Yellowstone to be a unique experience: it was cold, harsh, snowing. Temperatures ranged from -15°F to +20°F – even colder with a whipping wind – but it was also serene, starkly beautiful and unspoiled. No bustling tourists that you see in summer, just you and the sounds and sights of nature in hibernation or survival mode. The park is closed to all cars in winter. We traveled by a Snow Coach, a vehicle with a tractor drive, specially chartered for the purpose. Along with snowmobiles it is the only way to access the icy, snowed-in park roads. 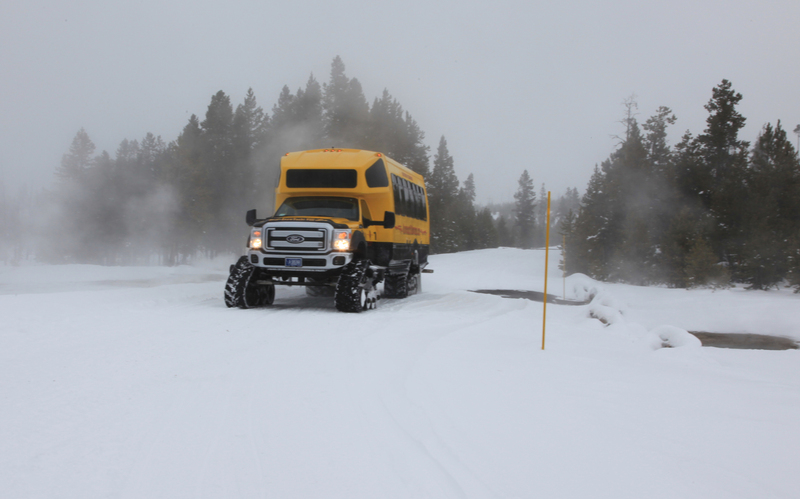 It trudges along at 15-20 MPH and provides ample time to soak in the winter beauty of the Yellowstone plateau which rises 6000 to 11000 feet above sea level. Yellowstone is the first National Park in the U. S. It was so designated in 1872 by President Ulysses Grant. The concept of a National Park was mandated for the first time – a wilderness and biosphere reserve to be maintained in unspoiled form for the enjoyment of the people. It is also huge, encompassing more than 2 million acres or about 3500 square miles (larger than Rhode Island and Delaware combined). It boasts the largest caldera of a volcano on earth, and while the volcano has not erupted full bore since 640,000 BC, simmering volcanic activity is still very much evident, as the hot spot just below a thin crust of earth sends up plumes of gurgling steam, erupting geysers and boiling mudpots. 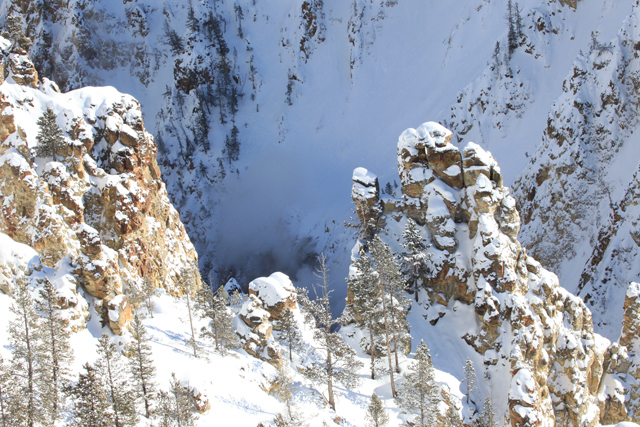 In winter the icy landscape is covered with a steamy vapor from all the hydrothermal activity that dominates the lava dome in the huge caldera. 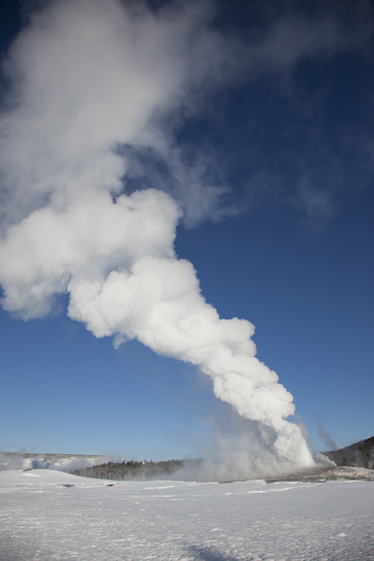 Yellowstone has some 10,000 hydrothermal features, about two thirds of all such features in the world! The most famous, of course is the Old Faithful geyser which has been erupting faithfully every 93 minutes, year in and year out. See slideshow from trip. Near this famous geyser is the origin of the Firehole river, which is fed by hundreds of hydrothermals creating a steaming, vaporous, fuming river, which never freezes as it runs through an icy landscape in temperatures sometimes as low as -60°F. 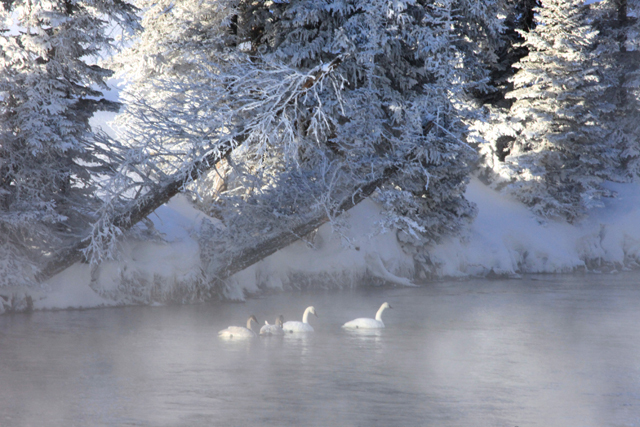 The Yellowstone River also originates in the park and flows into Montana and eventually into the Missouri river. It is huge – bigger than the Missouri and, had it been discovered before the Missouri, the biggest river system in the U. S. would properly have been called the Yellowstone river instead of the Missouri/Mississippi. 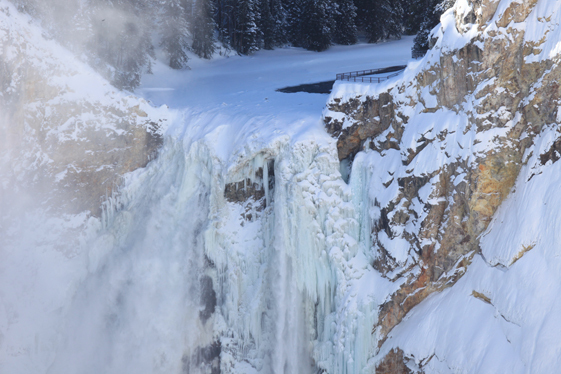 The Yellowstone River forms a magnificent canyon – known as the Grand Canyon of the Yellowstone – flanked by the majestic lower canyon falls. The Grand Canyon runs for 26 miles and is more than a quarter mile deep encompassing a sharp icy drop to the river from the towering mountains of the Yellowstone plateau. You see many animals wintering in the park. There are bison, their shags all covered with snow, rooting in the snow for the soggy grasses beneath. 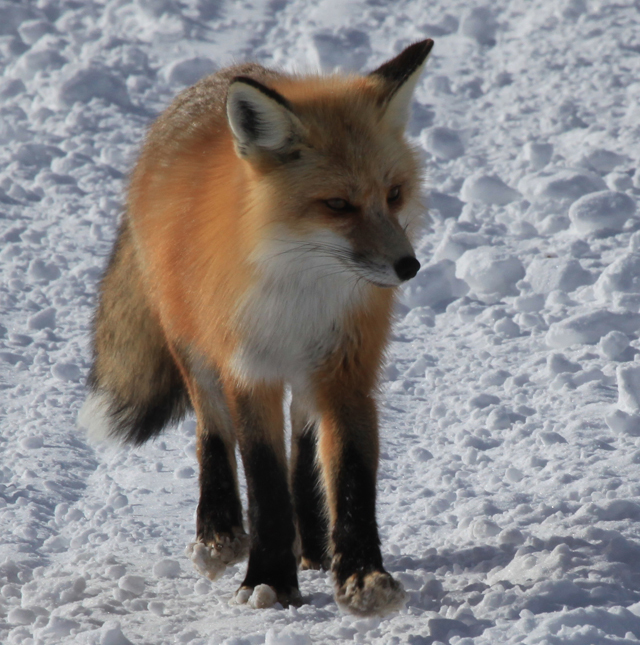 You also see the beautiful red fox, elk, coyote, trumpeter swans and, if you’re lucky, wolves. Lots of beautiful pictures to share from this memorable trip. Please check out a slide/video show here. It was a great week at Yellowstone National Park. My toes are still thawing out but it was well worth the discomfort. The mind was feasted with a landscape displaying its stark beauty and a bioscape of ethereal charm. This entry was posted in Photography, Science, Travell, Uncategorized. Bookmark the permalink. Beautiful shots – thanks for sharing! Thanks, Mary-Ann. It is truly a magical place. OMG! Ashok, this is so awesome!! I am so so envious 🙂 Would love to be part of any such photography expeditions in the future…..
On our dog-sledding trip along Alaska’s Brooks Range in Feb ’96…. I recall my fingers almost getting frozen when I slipped off my gloves for barely a few minutes to capture some wildlife on camera… How did you manage? Well written photo essay complimenting some amazing pictures! Enjoyed both! Beautiful! I went there in July of 2010. Looks completely different in the winters. So far it’s been the most beautiful place I’ve been to in the US. summer. It looks so different and much beautiful in these photographs. Thanks for sharing. Ashok, sitting in india right now and just finished viewing your beautiful pictures and video. Loved it, thanks for sharing. A great photo essay which captures the enthralling icy collage of Yellow stone during winter.We are motivated to be there whenever the opportunity arrives. Truly beautiful -and how different from the normal summer viewing! 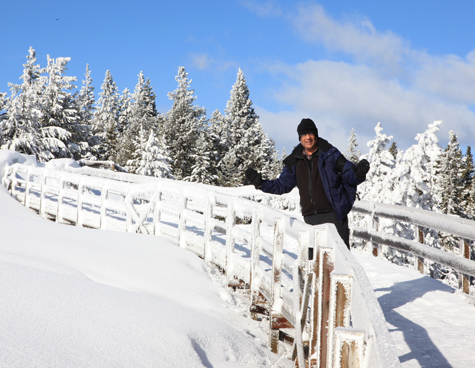 Thanks for sharing the photos – hope you thaw out soon! Thanks, Atul. Great to hear from you! Are we going to see you in this part of the world soon? What can I say! I wish I was there. This will enthrall even the folks at Yellowstone. Keep on sharing. my god ashok…this is truly a poem come alive. Am transported to a different world after watching this. What an achievement. This is a work of art that you have created. stunned ! Unbelievable. sheer beauty. Beautiful!! Definitely at the top of my list for travel destinations this year. Yellowstone was the last place we visited in the US before leaving in May 2010 and we were bowled over and thought that we had done it all but your magical pictures of Yellowstone in Winter are absolutely entrancing and have made me realize how much more unique it is under a coat of snow…. THANK YOU Banashri..
Hi Ashok, Wonder filled photo essay, thank you for bringing Yellowstone to us. Truly fantastic. what a treat!